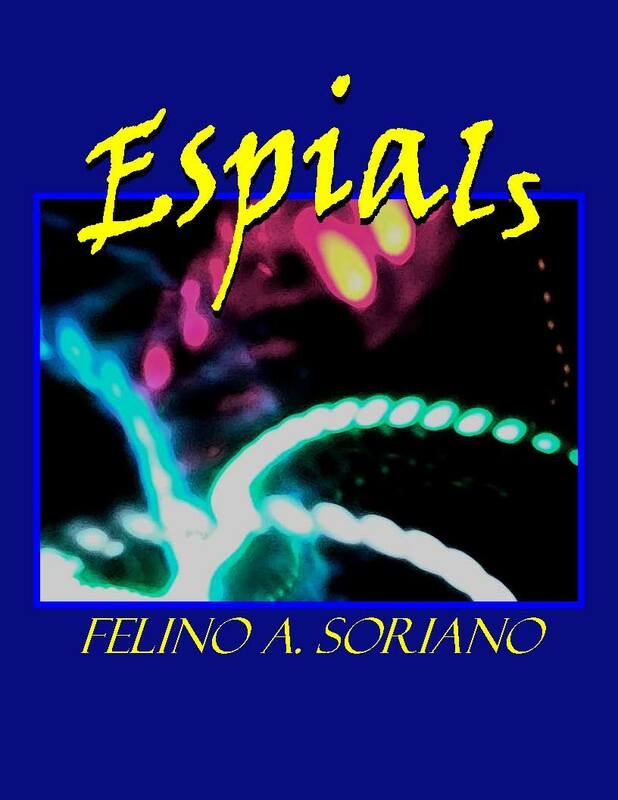 Stitching his language into the realm of the ethereal is what we find in Espials, a grand book of 100 poems by Felino A. Soriano, published by Fowl Pox Press, 2014. The book is delicately laced with sublime artwork by Paul E. Valente, a further tribute to this great work. The author is a diviner of smooth jazz as his lines step into the surreal with number 10- “…assignment to infuse callous onto the leading…” It leads the reader into soul-steps backwards onto the visceral plate of understanding as we are reminded of Walt Whitman and the spiral staircase to eternal dreams. He tells us the paradigms in life are good and we inquire, is this not a spectrum of love unfolding? We are mistresses to his words. He says in number 13, “…it is unsolicited…”, but we reclaim oneness with his words and beg for more. The lines flow like an effervescent vitamin, fizzing, spilling out into our eager tummies. It opens us up wide, ready for the reception of number 7, “…listening is friction, implicit…” The reader is aware of movement of the trombone slide, catapulting us into a new generation of Latin jazz on the page with Felino’s swift turning pen. One where experimental reasoning oscillates our pores and I say give me your turns and let the slide remain a magnitude of my essence. In number 14, “…the scored finality of hoping…” makes me delve into copacetic dreams. At the same time, Felino seems to ask the reader to step back and take a closer look. The meditation of his work is truly angelic and viscerally felt; it is the mind’s war games. Number 15 talks back to us literally, “…to be wholly healed…” here is a snake charmer dancing in whispers of the night’s transparence and we can’t question the magnitude of the love within this author that is expelled on the page for our tongues to taste and linger upon forevermore. We are enraptured by number 19, “…hovering halo holding angled hands…” Here, the poem jumps beyond black and white, asking the reader to rewrite history with him and we are obliged to say an empathic yes at the top of our lungs. There is a rotary circle within these words, a twisting of “…fundamental extractions…” and Felino is master and we his grateful servant, the bebop shining through like the piano tapping of Art Tatum, a master of tunes like Felino is with words. His vocabulary is astounding and we feel like his attending pupil. We submit to his words because of his great gentleness of mind, body and spirit. He guides us by the hand as if we were a delicate iris waiting to be saved and given the water of life, “…. We are indeed becoming music (number 22).” For me, one of the most striking images of deep compassion for the reader is in Felino’s number 24, “…although death, the final fixated manifestation…meaning is imminent.” Here, we linger into the ancient incised moon of the character seashell indignation, asking us how we can incorporate such greatness in simple lines of great beauty and intrinsic natural waves of decision with the humble soul of a blue butterfly. Or detrimental (to)….” Felino repeats this monumental exertion in syntax throughout the book and the reader loves him for it. We dream out loud with Felino as his scales of music are fresh such as in number 36, “….sitting at the beautiful moment, my hearing interpreted isolated fragments…” It keeps us amidst shadows of desire and another favorite moment is in number 39, “…undefined happenstance, veiled through the known…” because here we search behind the hidden dreams of the silent universal understanding. We are pulled into a dream state from which we wish not to wake up. Felino’s use of the English language is superior to most that I have seen and is a tribute to his well-read soul. The lines are very well expressed and full of a sublime sunlight reflection. In number 46, “…misery competes its edging-the body expands-holding us with renewed explanations,” and indeed we are held like a babe in her mother’s arms, sleeping and dreaming of a new day. The music of these lines keeps me coming back for more and I ask that we soar through all 100 of these poems, not wanting to miss a thing. Window…” and we dance once again beside him, rejoicing in the tango of our very souls. : Numerical clarities and then his use of bullet points in number 58, “…lists form –intuitive formations…” he is breaking the rules and it asks to experiment with our lives and to truly live. We preponder a perplexity and we go for this in sitting Zen meditation. Letting the words penetrate our minds and hearts like a jazz slide on the trombone. It is always present in these lines; it spins us and we rejoice that there is an expanse in which we can find ourselves and that clarity keeps us from the dulling of the senses. In other words, other poets are infused by Felino’s words and commune with him in a grand sense of wonder. The art is a fathomable dream especially in number 76 where, “…origami senses are broken by the outward reach of hands…” We sing alongside these words where the sax is in “…staccato tongue (number 79)…” formulating a grand blow to be heard by all the audience within spectral distance. The words fly on the Jazz great strokes of genius in number 88, “…becoming a flesh of deposited memories,” and we soar with him like eagles and tigers roaring on a safari of wonder. The music slides upon our open mind in number 95, “…in the now of structuring efforts spectral of deliberating direction…” We stand still and Felino’s eyes lead the way far from the abyss of loneliness into a new space-time continuum. He is fond of silent talking and soliloquies and repeats them throughout the poems. His lines make us remember Shakespeare like a diminishing sky of temporal awareness. So we see rather than fall into oblivion, we turn to these poems for inspiration to live, to write, and to be truly alive forevermore! Hala Hoagland studied Middle East History and Telecommunications in Colorado and loves everything francophone, although only fluent in the love of French culture. Her work is centered on the sublime whether Ekphrastic, Surrealist, Dadaist or just plain philosophically experimental. She is heavily influenced by Islamic culture as well and lives like any other North African. Her work seeks to show a lifelong poetic vein and to bleed through the pages a sense of love for the intrinsic beauty of art itself. She is hereby a dedicated life-long learner, former ESL teacher and into coding and decoding life, hence, the use of her name anagrammed for artistic temperance. Overall, she seeks to commune with other artists and hopes her work is a tribute to those she hopes to honor.